Well I am super happy to report that the Cowart's had a very normal week this past week (i.e. no break ins!). I tell you what I had no idea how much paper work you had to fill out for your home owner's insurance to pay for your stolen goods! 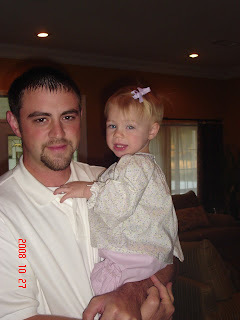 After months of being near bald and SEVERAL months of the Mohawk, I truly thought I would be grateful for any hair and/or hairstyle that Micah Claire would have. 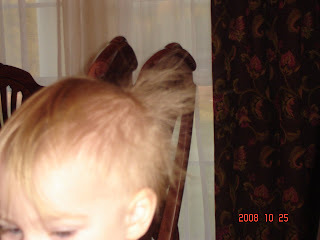 But, I tell ya this kids hair has gone crazy! 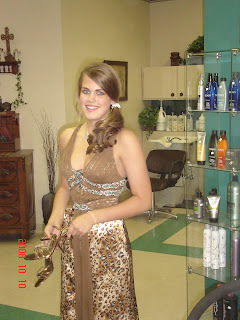 In the past all I had to due was put a bow in her hair to pull her bangs out of her face. Well.... these days we have to use lots of water to get her hair to lay down. I took some pictures Saturday morning at the breakfast table. 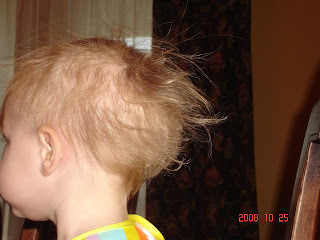 I promise you this is not stage; this is how her hair is now every morning when she wakes up. 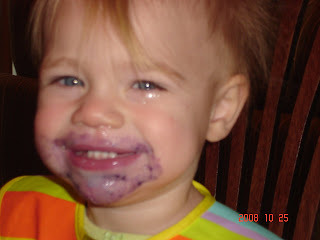 This child LOVES blueberries, but they are so hard to clean up that I only give them on mornings when I have a lot of time to clean her up. Look at those finger nails! On Wednesday Night Aunt Ashley came and spent the night with us. 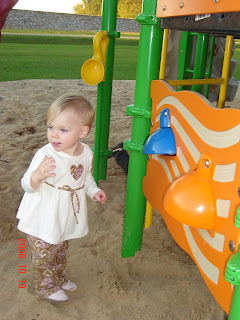 Micah Claire had a great time playing with her (or should I say entertaining her). Aunt Ashley likes to gossip about our favorite shows (biggest loser, private practice and of course Grey's). But since the birth of M.C. I haven't got to seen an entire show of any of these. I think after spending an afternoon and night with us Aunt Ashley totally understands why I only see bits and pieces of our fav shows! On Sunday daddy finally had time (out of his BUSY hunting schedule (just picking Willie!)) to go to the park with us. 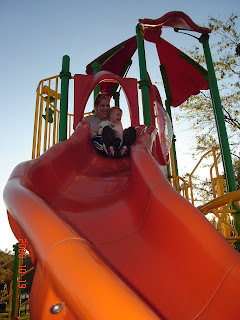 He and Micah Claire had a blast swinging and sliding together! Would've been nice if I had taken pictures; maybe next time I'll remember my camera! I can't believe that Halloween is this week! I can't wait to take pictures of Micah Claire in her monkey outfit. It's so ugly that it is cute. When we tried it on she didn't like it one bit; and when she saw her self in the mirror she cried! So, we may not get too many pictures; or happy pictures this Halloween. Micah Claire's new thing is reading; she loves for you to read to her. I think we read every book she owns every day. It's so cute to hear her read to herself. But, every time I get the camera out to video her she stops. I got lucky and caught this one moment on video. She is reading her favorite book called Peak a Baby. When she lifts up the flap I think she is trying to say peak-a-boo but I am not 100% sure on that. 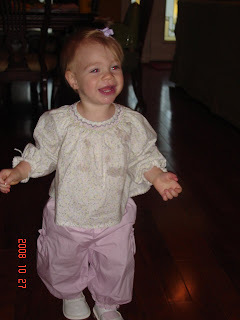 I just couldn't resist taking a few pictures this morning of Micah Claire in her french out fit! My mom's friend Cynthia went to France last summer and she picked up this super cute outfit. I have no idea what is on the tags or on the clothes b/c it's all written in French (guess I should have payed more attention in my 2 years of French class). Okay, but here is the KICKER to the story!!!!!!!!!! The police watched them drive out of our drive way, yes I said they watched them drive out of our drive way. The CHIEF OF POLICE was sitting in the church parking lot across from our house and watched them (in his our words) “come speeding out of the drive way.” He thought I got a new car and was running late on my lunch break and he was going to be nice and let me go. (again… hindsight is 20/20). If only he had pulled me over he would have seen it WASN’T me! Oh well…. Like I said everything can be replaced expect for my videos and my necklace. The only good thing that came from this was that these PUNKS have robbed several people in the last few weeks but no one has seen them. Luckily (and I say that somewhat sarcastically) the police now know what they drive and have been able to figure out who drives it. I can’t say too much but it turns out they are 2 YOUNG PUNKS with previous records. The police are working very hard to pin this on them and find our stuff! I have to give a big thanks to all our friends and family who brought us food, helped us clean up, called and checked on us numerous times and those who have been praying for us. It’s so nice to know there are still great people out there. So of course neither Shawn nor I slept Wednesday night. On Thursday we went to Hot Springs to get new door handle, a new Rhino starter kit and I got me a pistol! I am now an official “Pistol Packing Momma!” Shawn spent the afternoon teaching me how to load the clip, aim and shoot (which is way harder than I thought) and how to clean it. We also had an alarm system installed! Let me tell ya, it works. It has a “glass break” feature on it. On Saturday morning I was cleaning the house and MC got a hold of the broom. She dropped it on the tile floor which set the alarm off! 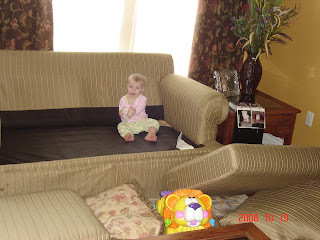 It scared her to death; it took several minutes for her to stop crying and me to stop laughing!!!! Saturday night was my 10 year class reunion. It was great to see and catch up with old friends that I haven’t seen in years. We stayed out till almost midnight (something I haven’t done in years!) My mom has been begging me for months now to let her keep Micah Claire overnight I have always said no. But, I finally said yes (mainly b/c Shawn said I had to). 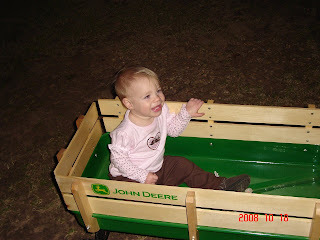 We dropped her off a little before 7pm and she immediately went and got into her wagon. Nana took some pictures for us and off we went. I was up at 4:40 am and I wanted to go get her but I held off till 7:30am. I expected to find them up having breakfast but they we’re still in bed. Micah Claire was so happy to see me and vice versa! 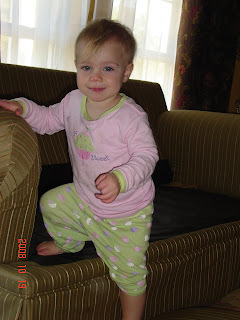 She had a runny nose and Nana swore up and down it wasn’t running when they went to bed. So we ate breakfast with Nana and headed home to get some Tylenol and Benadryl. She was kinda fussy and wanted to be held all morning (which I had NO problem with since I missed her just a little). 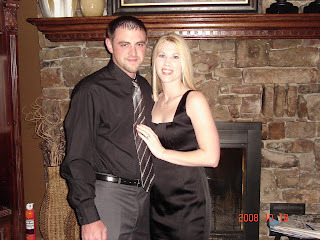 I don't think we've gotten dressed up and had an evening to our selves in over 2 years! 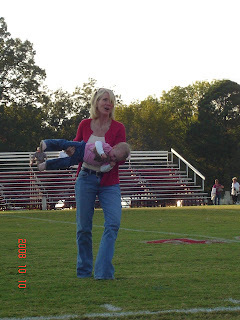 Here she is trying to get away before she could get in trouble. Even with that runny nose she's still a cutie pie! 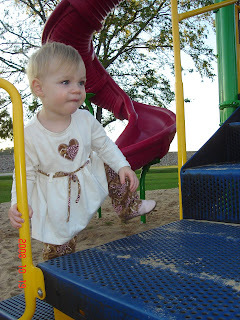 I promised Micah Claire that if she were good for Nana on Saturday night I would take her to the park on Sunday (her new favorite place!) Even though she had a runny nose I felt like I had to hold up my end of the bargain. So we went late Sunday afternoon and the park was packed. 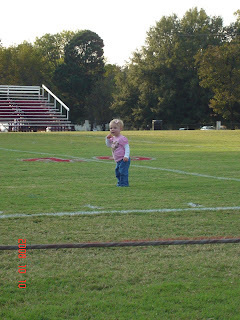 MC had a blast watching all the kids run around! I sure hope this week is less exciting as last week! Sunday night when she was playing the tub she walked over to her turtle (which holds all her tub stuff). She flipped open the shampoo lid and pretended to put some soap in her hand. Then she started rubbing her hands all over her head. It took me a second to realize what she was doing. I asked her, Micah Claire are you washing your hair? She looked at me (like are you blind) and said YES! It was just too cute! And her new word this week is Thank You! It's so funny to hear her say it, it comes out as one word and sounds like tanku! 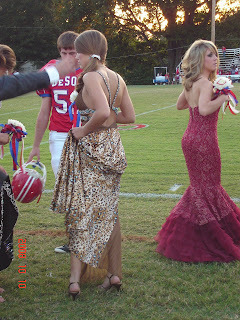 This dress was to die for! This picture doesn't do it justice. Of course when your that skinny you look great in anything! The back of this dress was all topaz stones, stunning! 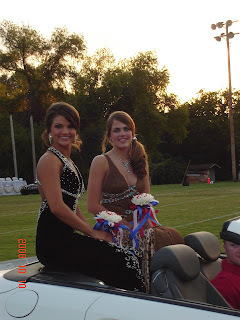 Here is Amy Jo and Kaitlynn being driven around the football field in a 2009 Mercedes! 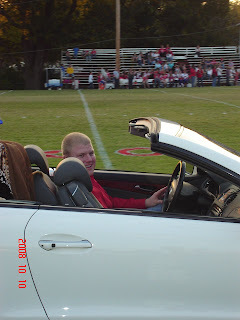 It was a NICE CAR to say the least!!!!!!!!!!!!!!! 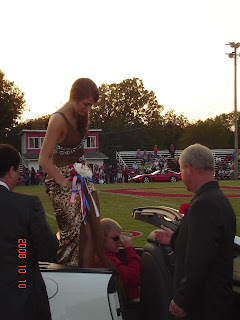 Here is my Uncle Mike helping Amy Jo out of the car and escorting her onto the football field. 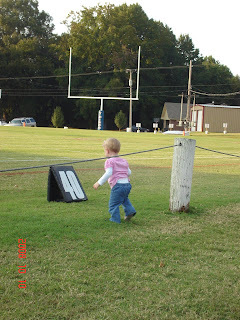 Here is Micah Claire headed for the football field. 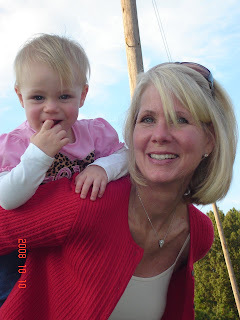 MY TWO FAVORITE GIRLS IN THE WHOLE WIDE WORLD!!!!!!!!!!!!!!!!!!!!!!!!!!!!!!!!!!!!!! 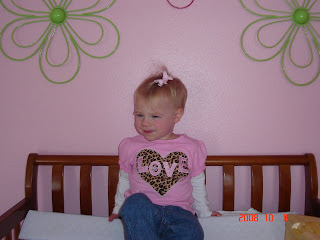 It seems like just yesterday we were having Micah Claire's 1st birthday party and now she's 13 months old. Where or where is the time going? 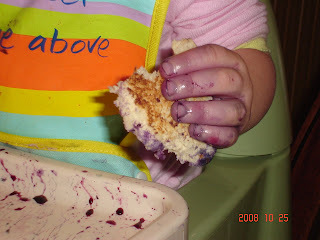 Well, we finally got our results from our allergy testing. As suspected, she has a severe allergy to eggs. The test showed a .37 wheat allergy, which basically means she can eat wheat with no problems. We also found that she has a slight allergy to peanuts, so that means no peanuts till she's at least 3 years old. There is a very good chance she may out grow this allergy! 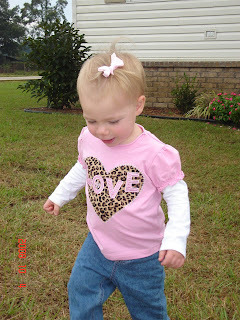 And the big news... she has a milk allergy. I was stunned to find this out. MC was exclusively breastfeed for 10 1/2 months and then took a little bit of a milk based formula till she was1; all with NO problems. She has had a little bit of a runny nose since she started whole milk. But, I just assumed that was due to the weather change or maybe she had an outdoor allergy. Our doctor said it would be impossible for her to have an outdoor allergy at this age because she hasn't been exposed to three of cycles of ragweed. Well, we started on Soy milk this weekend and I'll be danged if her nose didn't dry up. I tell ya what, I've learned more from having a child than I did getting my undergrad or graduate degree. I think if I had to come up with a slogan for my life it would be........" Kids, they'll teach!" 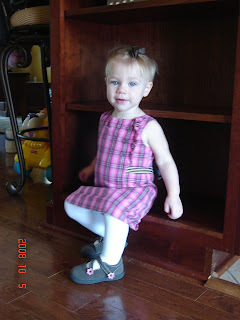 Here is Micah Claire waiting to go to church in her dress that Mimi bought her. 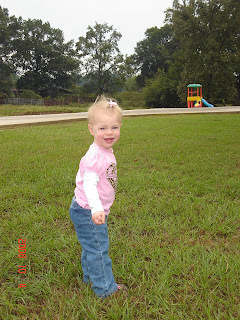 She is always on the go these day! 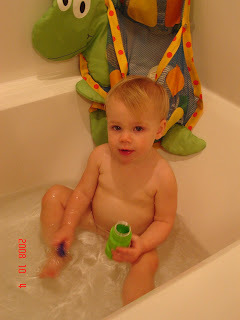 These days M.C thinks it's more fun to throw her toys out of the tub than play with them in the tub. Which of course makes more work for Mommy!